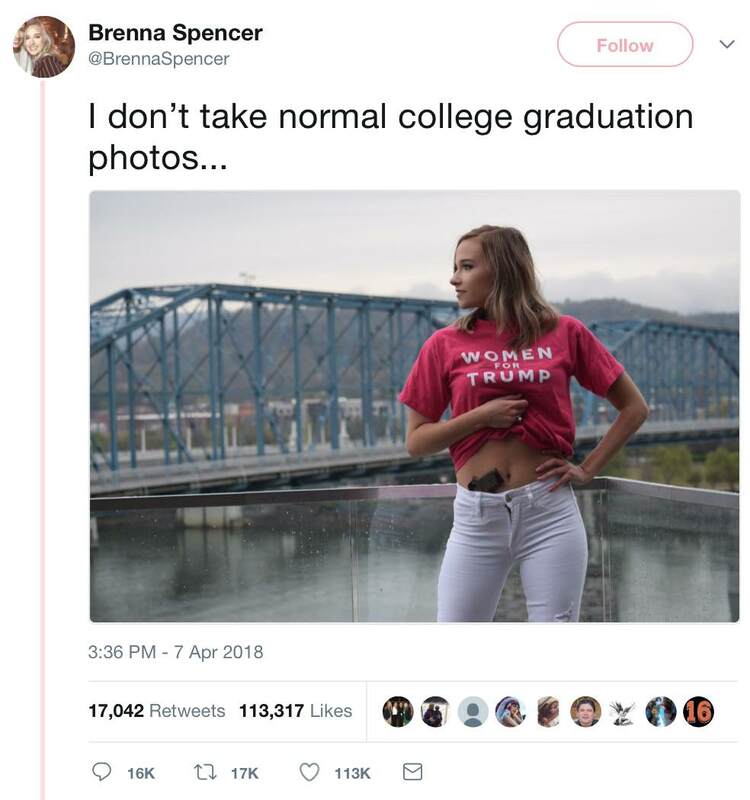 A one-sided Wednesday report at CBS News tried to convince readers that University of Tennessee-Chattanooga student Brenna Spencer's "I don't take normal graduation photos" tweet picturing her with a firearm generated significant "backlash." 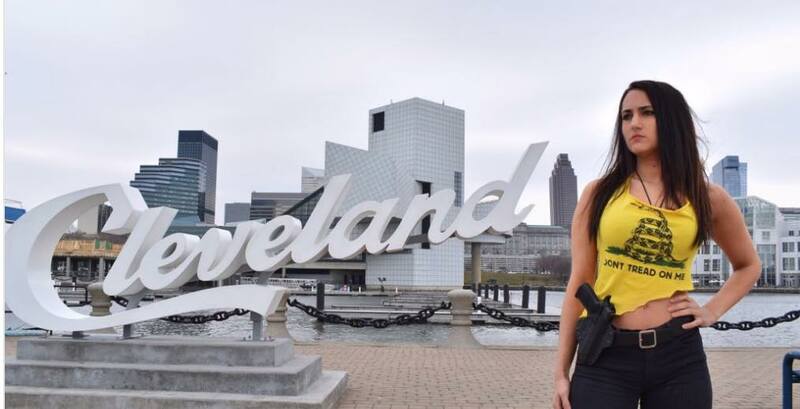 To create a false impression, the network cited critical tweets from two users with a combined eight Twitter followers, ignoring far more significant support Spencer received, including two Second Amendment-supporting women with a combined 160,000 followers. A University of Tennessee-Chattanooga senior's graduation photo has generated controversy on social media. In the photo, Brenna Spencer is seen wearing a bright pink "Women for Trump" T-shirt with white jeans. 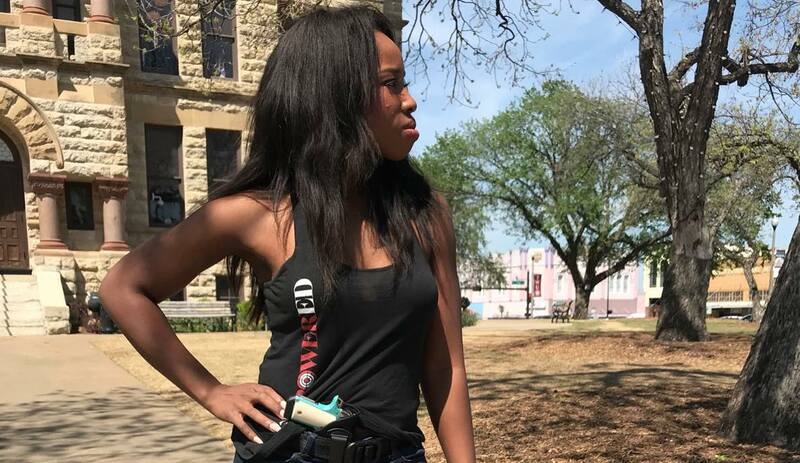 A black handgun is tucked into her waistband. Spencer shared the photo on Twitter Saturday and captioned the post: "I don't take normal college graduation photos." Some of her followers praised the photo. Here I am in solidarity with Brenna, also carrying in public. We will NOT allow for Leftist intimidation tactics to hinder our inalienable #2A rights. It is indeed true that ABC News reported Monday that it contacted the Chattanooga Police Department in the belief/hope that Spencer might have violated the law. She didn't. Building its case for "backlash," CBS cited three critical tweets. The Daily Caller's Joe Simonson observed that one critic had "a single follower." Thursday, Fox News contributor Stephen Miller noted that "Two of the three accounts CBS uses to prove online outrage have a combined twitter following of 8 people." The third had just over 1,300 at the time of today's post. The two tweets with accompanying photos above came from accounts with a combined 160,000 followers. In July 2016, NBC News reported that "An October 2015 Gallup poll found that 50 percent of 18-29-year-olds support stricter gun laws compared to 57 percent of those 30-49, 56 percent among those 50-64, and 55 percent among those 65 and older." "A 2017 Pew Research Center poll ... (found that) Millennials did differ from their elders in two categories of gun control: Banning assault weapons and high-capacity ammunition magazines. They're actually less supportive of those bans ..."
The UK Guardian reported in November that "Resistance to a ban on military-style assault weapons is strongest among millennials." The Guardian tried to blame video games. In a November 2015 column, the Washington Post's Catherine Rampell called millennials' support for gun rights "mysterious." Rampell, and many others in the media, need to get out more.